You might have heard about grey market key reseller G2A – it’s become really big business. But despite its size now, some of its practices still manage to raise an eyebrow. There’s always the best free PC games if cheap isn’t cheap enough. G2A is a marketplace for key resellers, allowing online shops to reach a large audience of gamers with cheap game keys.However, as G2A themselves don’t sell the keys – they come from independent sources – there are sometimes issues with them failing to work properly. 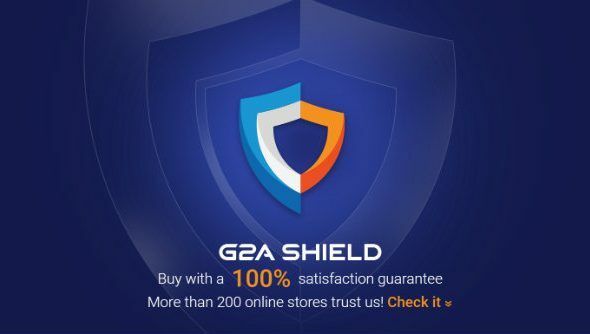 That’s why G2A offers a subscription service called G2A Shield. This is a service that apparently protects you from keys that don’t work, but there’s very little on the site about how that works exactly. I used the site’s live chat service to get a better idea. 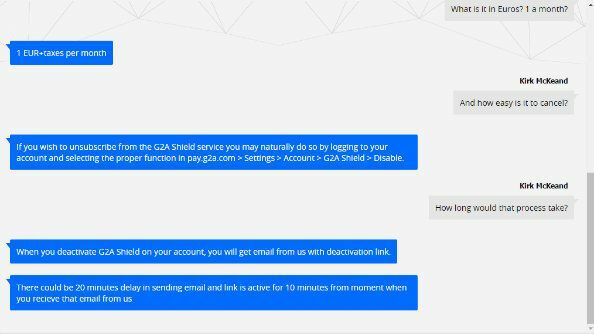 According to a customer service representative, G2A can still refund you if you get dud keys, but Shield shortens the waiting time for refunds from nine days to five days. G2A Shield used to require users to hand over a remote access view of their PC while they input a code, so they could confirm. Now it’s a bit more streamlined and you just need to send them an error message or screenshot to get problems sorted. The main issue with G2A Shield – which I’m told is €1 + taxes per month – is when it comes to cancelling, as one redditor has pointed out. In a lengthy Imgur album, HiUsernameImDad detailed every step of the cancellation process, which took16 clicks across 10 screens. The first screen asks you to confirm which Shield benefits you would like to disable, and you have to click all six before telling it to cancel. Of these six, I can say with confidence that at least two of them (access to 24-hour live chat and 200 retail stores) are there for all customers, subscribers or no. Following that, it asks you to tell it why you’re leaving. Then on the next screen it offers you a half-price deal, and another deal pops up on the page after that. After that, it asks you again if you want to leave, but with the wording “I don’t want the 100% purchase protection”. Then it tries to guilt trip you by saying “I thought we were friends” on the next screen. With the option “disable subscription now” here, you would think that was the end, but it gets worse. You then have to verify your credit card, followed by email confirmation. It’s here where things get more questionable. As you can see in the screen above, G2A say that the confirmation email can take up to 20 minutes to come through.According to the Reddit post, this process takes almost exactly 20 minutes too. I asked customer service about cancellations and they told me that these links are only actually active for ten minutes from when you receive the email. So if you miss it by nipping off while you wait for the email, you need to wait again. It seems like a good way to make people give up. If you do stick it out, though, you’re finally done. G2A should probably take a hard look at this process and see if it can be improved… which it definitely can. Some, myself included, clearly aren’t comfortable with things as they are, and it hardly screams “user-friendly experience”. But we’re curious to know, have any of you had similar issues? Or a better time with G2A Shield? Tell us below.